To restore Louisiana’s coast, we need a suite of large-scale restoration projects across the coast working together to deliver maximum benefits and reduce land loss, restore ecosystems and maintain habitat. In this “Restoration Project Highlights” series, we’ll be taking a deeper look at specific projects from our list of Priority Projects, highlighting why they’re needed and hearing local perspectives about their importance. A local’s perspective on the River Reintroduction into Maurepas Swamp diversion. What is the River Reintroduction into Maurepas Swamp project? 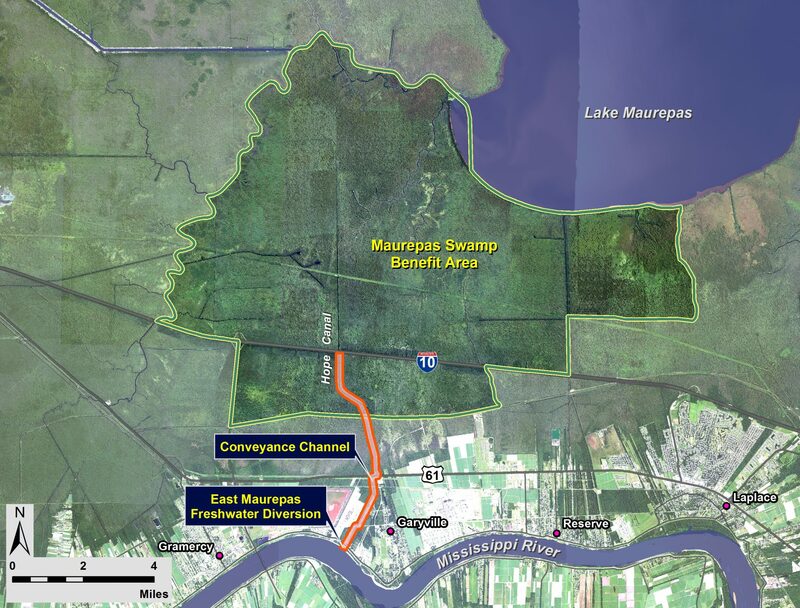 The River Reintroduction into Maurepas Swamp project, formerly known as the East Maurepas Diversion, is a diversion project in the 2017 Coastal Master Plan intended to sustain the Maurepas Swamp, one of the largest remaining forested wetlands along the Gulf Coast. Diversion projects include gates placed in the river levee that open at specific points of the year and use the power of the river to move fresh, oxygenated water and some sediment from the river through a canal into nearby wetlands. This process mimics the way the Mississippi River historically sustained the land on which communities across south Louisiana live. This proposed diversion will be located on the East Bank of the Mississippi River near Angelina and Garyville in St. John the Baptist Parish. Why is the River Reintroduction into Maurepas Swamp diversion so vital to Louisiana and the nation? This restoration project will help maintain and improve the health of 45,000+ acres of swamp south of Lake Maurepas. In addition to being beautiful places to Instagram, swamps provide many benefits, including reducing storm surge from hurricanes and flooding and stifling erosion, as well as incredible habitat for birds and other wildlife. Across Louisiana, our swamps also help make Louisiana the “Sportsman’s Paradise,” providing incredible ecotourism opportunities from kayaking to birding to fishing and hunting. One study estimates that more than 2 million people visit Louisiana annually to hunt, fish or see wildlife. This project will complement other nearby diversions being planned, including the Union and Manchac Landbridge diversions. Together, these diversions maintain important swamp and coastal habitats that help protect many communities in the region, including Baton Rouge. These projects will help maintain the Manchac Landbridge, a narrow strip of land between Lakes Pontchartrain and Maurepas. This landbridge will prevent the two lakes from merging, a situation that would be devastating and could send storm surge to communities from the River Parishes into the Greater Baton Rouge area. Many factors contributed to the decline of the Maurepas and other swamps across Louisiana. Settlers logged these old growth forests, diminishing these once expansive landscapes of massive bald cypress and other trees. They also cut canals and dug ditches through the swamps, allowing salt water to intrude that altered the natural hydrology and caused further plant die-off. At the same time, the levee system along the Mississippi River cut these swamps off from the river, essentially starving the swamps of the sediment and fresh water that are needed to keep them healthy. The introduction of nutria in the 1930s worsened the problem as nutria ate or destroyed the new seedlings growing back after the logging. Regular flooding, natural subsidence and impoundment also exacerbated the problem by preventing the occasional drier conditions necessary for seeds to germinate. Lastly, the Mississippi River Gulf Outlet (MRGO) pushed salt water deep into the swamp, killing existing trees. This diversion, and others in the region, can help repair some of the damage caused by the factors above and protect the Maurepas Swamp into the future. The fresh, oxygenated water will help battle the saltwater intrusion and push out the stagnant, low oxygen water that reduces growth rates and affects tree health. The small amount of sediment that will be transported will help offset subsidence and increase elevations enough to allow for drier conditions, enabling seed germination and creating the next generation of trees! When will the diversion be constructed? The diversion received funding through RESTORE Act Pot 2 funds in 2017 to complete engineering and design, permitting, land rights acquisition and pre-construction monitoring to get the project construction ready. These activities should be completed by 2020 at which time the project will be ready for construction. Construction is estimated to take 4 years. What does a future without action look like? What does a future with action look like? Future with action assumes all projects in the 2017 Coastal Master Plan are operating. How will the diversion benefit wildlife? Maurepas Swamp is recognized as a continentally Important Bird Area. Many species of ducks, herons, egrets, songbirds – even Bald Eagles – can all be found within its borders. The swamp sustained by this diversion will serve as prime habitat for the Prothonotary Warbler, a bird species that thrives in swamp forests. Credit: Erik Johnson, Audubon Louisiana. The Prothonotary Warbler migrates relatively early in both spring and fall, with peaks in many areas during April and August. A very rare stray in the west, mostly in fall. During the summer breeding season, high densities of Prothonotary Warblers can be heard and seen within this swamp. The Prothonotary Warbler (aka “golden swamp canary”) is a migratory species that inhabits wet forests throughout its range, and is unique among the eastern wood-warblers for its use of tree cavities to nest. 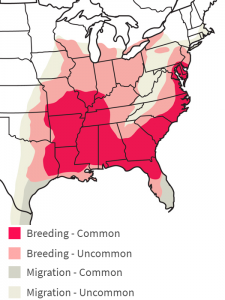 It is estimated that Maurepas Swamp hosts 1.2% of the global breeding population of Prothonotary Warblers – a notable percentage relative to the overall size of the species’ breeding range. 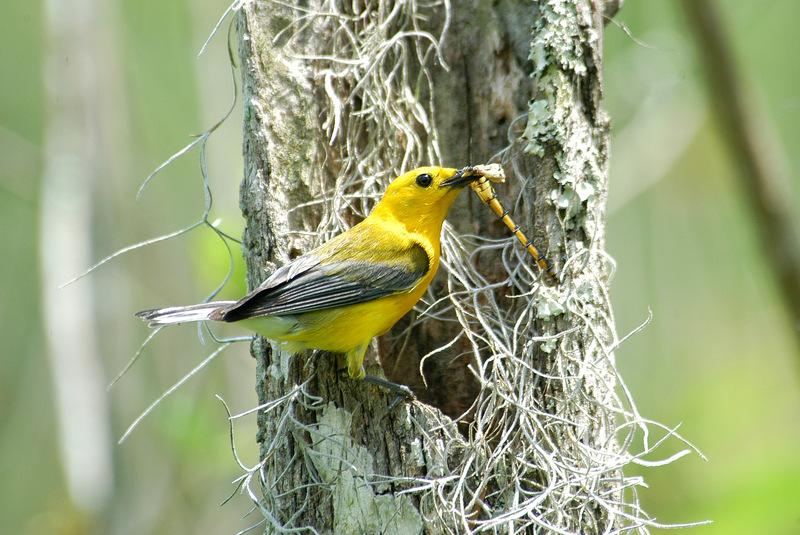 Although Prothonotary Warblers may use degraded swamp for nesting, further decline of the swamp into open marsh or open water will eliminate habitat for the species. Thus, the swamp that will be sustained by the river diversion will preserve breeding habitat for the Prothonotary Warbler, in addition to many other forested wetland species such as deer, otters, osprey, swamp rabbits, wood ducks, squirrels, muskrats, snakes, turtles, and 18 species of concern, including the bald eagle, mottled duck, swallow-tailed kite, Louisiana black bear, American alligator, alligator snapping turtle and southern dusky salamander.